Yes, I'm looking back to the old days as an ALPHA Tracker. Feel free to compare it to your generic internship experience at that local small business down the street from the University. The effort, time, and dedication must've been about the same as any other person trying to work their way up in any career. The only major difference that plagued me was a lack of income. I learned very quickly that Ghost Hunting leaves anyone who crosses its path in the red, but they always say you must love what you do. Why didn't we earn any cash to sustain ourselves on a steady diet of fast food and dollar store cleaning supplies? Because it's not the ALPHA way to charge for investigations. ALPHA Ghost Team is an organization that prides itself in helping people and business in need of answers, even if it means taking a financial hit. Even more of our money (which has probably been converted from the sale of furnature and appliances from Scott's appartment) is put into visiting different conventions in Florida to present our informational lecture series. An informed public is a better public, and ALPHA is doing our part. Alright, enough about ALPHA. We already know the group has a great reputation in the field and all that jazz. You want to hear about Panama City, don't you? Of course you do. Well, this took place back in Summer 2009. Is that vivid enough for your imagination? No? It was hot. Better? Good. 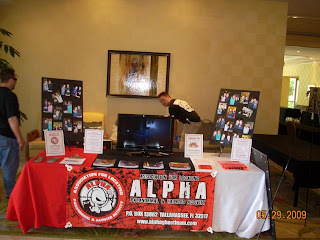 I have been going on about 7 months as an ALPHA Tracker, and the group was invited as guests at the Wrath of Con in Panama City (which is a great name for a nerdy gathering, if I do say so myself). Ron and Scott needed some extra manpower, so they figured they'd take advantage of my youth and excitement. I was quite the overachiever, and I wanted to do everything and anything I could to impress the best in the paranormal field. This boiled down to manning the booth we had set up. Pretty impressive. Ron, Scott, and Lacey owned the lectures throughout the weekend while I dealt with a rather... how can I put this... a scarce crowd. I can say I spent most of my time scoping out the Star Treck booth that was across the way from where I sat. It probably didn't annoy the guy dressed like the captain that I was watching his every move like he was going to spontaniously break out into dance. The highlight of the weekend was when Kevin Sorbo (Hercules) stopped by for a few hours to sign autographs. He must've had all 60 of the convention visitors lined up at his table at one time! That basically sums up what the empty convention was like during the day, but what happened after the sun went down was a whole other beast. There was a celebrity after party hosted by the owner of the convention which was nothing short of epic. I had the opportunity to mingle with TV and Movie Stars like Jerry Doyle, Chase Masterson, J.G. 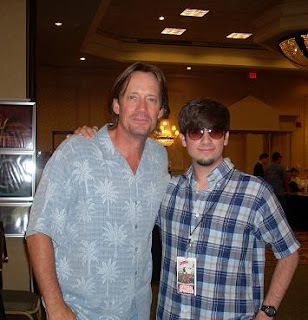 Hertzler, and Kevin Sorbo. Even though everyone was there to let loose and party it up, I was still there to represent ALPHA. This worked out, because it seemed like drunk celebrities were more excited about ghosts and my knowledge on investigating than when they were sober. Needless to say that by the end of the convention weekend, everyone knew everything about ALPHA. On a side note: Scott Tepperman and I pledged our services to a fundraising event for Habitat for Humanity. 'Twas a slave auction. People bid on us celebrities to do anything the winner wants for 3 hours (Nothing sexual implied). Scott was auctioned off for 45 dollars... I was auctioned off for 50 dollars. All I remember was a loud, obnoxious, New Yorker yell out "Really?! For that?!" when I surpassed Scott's auction record. Of course the heckler was Scott, who else would it be? I tend to rub it in every once in a while, just to keep the man in check with who was worth more at the time. At the end of the weekend, I walked away with my first taste of what it was like to be on the celebrity side of a convention. It was a great feeling, but I didn't let that get in the way of why I was there. It was all about ALPHA and making sure that questions about the paranormal were answered. Keeping the mentality that my job is 24/7 is one that I still carry with me to this day, as a full-fledged Investigator with ALPHA. If I could, I would go back to Panama City in a heartbeat. A slow-paced, Wrath of Con heartbeat, but a heartbeat nonetheless. "Why didn't we earn any cash to sustain ourselves on a steady diet of fast food and dollar store cleaning supplies?" I love this sentence. Yes, why didn't you fund that crazy diet of cleaning supplies? I remember being told those things were poisonous... but if it's dollar store quality, then maybe it's not as potent. Hahaha. I've been around. You may or may not know me from the feature length movie "Dead Air: Live From The Windsor Hotel", Dead Serious Radio, as well as L.E.P. Radio. I've made a few other media appearances with the ALPHA Ghost Team on local television and in a few newspaper and magazine articles. Click HERE to visit Bill's official voice acting website where you can contact Bill about voicing in YOUR project! Click on the Picture to Listen to Archived Episodes. 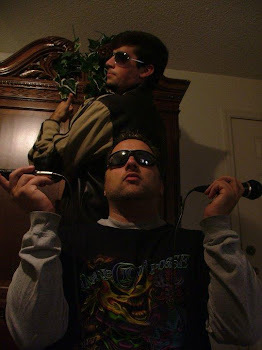 Scott Tepperman and Bill Karalius... Karaoke Legends.